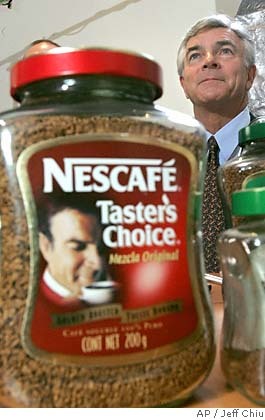 The California Supreme Court is hearing argument today in the case of Russell Christoff, a former model who, in 2002, happened to notice his own face staring back at him from the label of a Taster's Choice jar, and sued Nestle USA for using his image without permission. Christoff had posed for some photos for the company sixteen years before, for limited use in Canada. A Nestle employee apparently pulled that photo out of the archives in 1998 and, unbeknownst to Christoff, made him the new Taster. The photo was used on labels in 21 countries in addition to the U.S., where Christoff later came face-to-face with himself. After a face-to-face meeting with a lawyer, Christoff realized he might have a cause of action for a breach of his "right to publicity," as California calls a claim for using your likeness without permission. My favorite fact about this case has always been that, when the company needed a Taster for Latin America, rather than hire a Latino they just Photoshopped the image they already had to give Christoff a darker complexion, and some sideburns. Ole! My main issue with the case is not so much the cause of action, since the company does appear to have acted without permission, but rather the damages. A jury awarded Christoff $15 million for the unauthorized face appropriation, after an expert witness regaled it with tales of how important the iconic Taster was to Nestle's profits. In any event, the appellate court reversed. The question now before the state supreme court has to do with California's "single-publication" rule, a rule usually applied in defamation cases that requires claims to be made within two years of the first publication. Since Christoff did not see himself on a jar until four years after his first appearance as The Taster, if this rule applied, his claim would be barred. Anyway, I have reported on this case a couple of times already, so I won't belabor it here. One of those reports was written when, by chance, I happened to be in the courtroom for an oral argument in a different case on the same day that the Second District Court of Appeal was taking up the Taster's Choice matter. Among other things, I noted that the female justice on the panel remarked more than once that Mr. Christoff (who had brought his entire family) was still quite a handsome man. I am confident she still voted to decide the case on the merits, however.